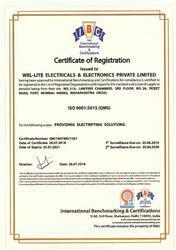 We,Wel Lite Electricals & Electronics Private Limited, are one of the illustrious authorized, Manufacturer, and trader of HENSEL Industrial Enclosure Solutions, AC Drive Panel, MI Power Distribution Boards, Electrical Panel Board, Distribution Panel, Cable Drum Sound, Hensel Cable Drum, Circuit Breaker Boxes, Hensel Junction Box, Fire Resistant Junction Box, Plug and Sockets Watertight, Interlocked Socket- Outlet And Electronic Socket of well-acclaimed brands. Various brands from where we procure the products are Hensel, Pierlite, Flash, Havell's, Hikvision, Walther. Strategically based at Mumbai, Maharashtra (India), we have skillful sales and technical team for successfully placing the products in the market and meeting the variegated demands of our clients. Furthermore, our specialization in providing complete design solutions for the interior at the most economical prices has helped us make clients in Indian Subcontinent, East Asia, Middle East, and South East Asia. Owing to our expertise, we have been able to undertake various lighting projects for reputed organizations such as SBI, Raheja Builders, Poddar Soc., and ICICI Bank. We are also proud to be associated with Electrical Contractor Companies in Mumbai like Sterling & Wilson Electricals Pvt. Ltd., Pravin Electrical Pvt. ltd., Antelac Ltd.
At our premises, we have a capacious warehouse where all the procured products are safely stored till delivery. This wing is segregated into multiple sections for proper storage of different products. Moreover, it is facilitated with excellent lightning and security facilities. Our team of storekeepers ensures to efficiently handle the inventory for obstacle-free delivery process. We also understand the significance of safe packaging of Xcent Lighting, Commercial Lighting, Junction Boxes and Insulated Plug Sockets. The packaging of these products is done to ensure that they do not meet intensive damage at the time of transit. We are counted amongst the distinguished authorized distributors and exporters of Industrial Enclosure Solutions in Engineering AC Drive Panel, MI Power Distribution Boards, Electrical Panel Board, Distribution Panel, Cable Drum Sound, Hensel Cable Drum, Circuit Breaker Boxes, Hensel Junction Box, Fire Resistant Junction Box, Plug and Sockets Watertight, Interlocked Socket- Outlet And Electronic Socket. These products are sourced from the most credible brands like Hensel, Crabtree, Pierlite, Flash, Havell's and Walther. At the manufacturers premises all the products are designed and developed as per the prevailing international standards. The use of premium quality raw material further makes the end product durable. All the products are available with customizations solutions at the most reasonable prices. The immense success that we have obtained in this domain is the output of our vendor’s diligence and our expert’s professionalism. Our team of professionals works in close coordination with each other to ensure smooth procurement and delivery of Xcent Lighting, Commercial Lighting, Junction Boxes and Insulated Plug Sockets. The painstaking efforts of our manpower have helped us attain excellence in whatever we do. Moreover, we regularly organize training and workshop sessions for our experts to keep them well-informed about the prevailing market trends, and to enhance their skills. Throughout our business operations, we have followed client-oriented practices to meet optimum client satisfaction. In this regard, we provide our clients a stupendous range of Xcent Lighting, Commercial Lighting, Junction Boxes and Insulated Plug Sockets which is procured from some of the notable brand names. Our business associates deliver defect-free products within the committed time frame. We have won huge recognition for offering cost-effective products with customization solutions. Furthermore, we have always followed ethical business policies and maintained integrity at the time of transactions. Leveraging on our visionary approach, we are able to add credibility to our name, and associate ourselves with Electrical Contractor Companies in Mumbai like Sterling & Wilson Electricals Pvt. Ltd. and Antelac Ltd. We have also executed total lighting projects for SBI, Raheja Builders and ICICI Bank.